What would you do if you feel like eating some rich chocolates, but not cake, and you don't have chocolates at home? I would think, a simple solution will be, a brownie. 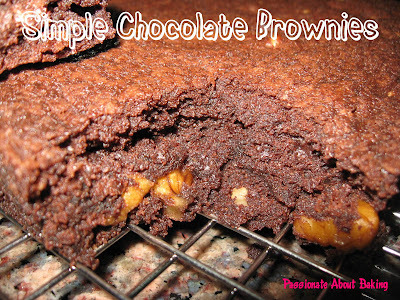 Not any difficult, having to melt chocolates kind, but a simple chocolate brownie will do. This is what I baked this evening - A Simple Chocolate Brownies. It's really that simple and the smell is really good too! 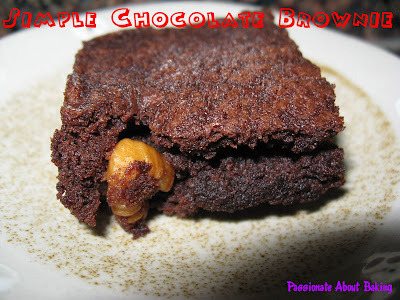 Using only cocoa powder, the results is as good as any other brownies! There is really no other recipe as easy as this! Just try it, you won't be disappointed! After attending Chef Jocelyn's Chocolate Workshop some weeks back, I've been itching to want to try her recipes, in particular, the Nutella cupcakes. However, there was no one that I can give to, so I decided to wait for the right time. 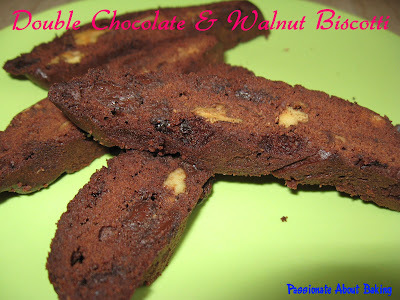 Instead, I tried her Double Chocolate & Walnut Biscotti. 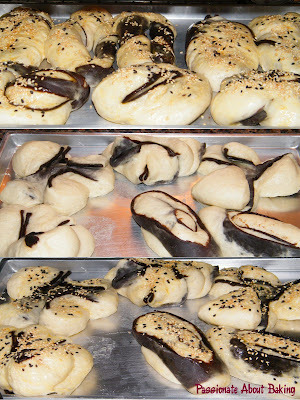 I made the doughs last weekend and put them in the freezer. This morning, I just took them out to bake it once, then again after slicing. I used the Valrhona cocoa powder and some dark chocolate couverture chips instead of Valrhona Perles as stated in her recipe. 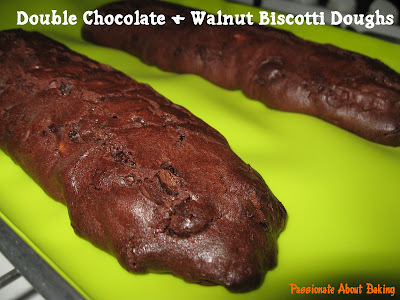 I like this biscotti because it is not so hard and dry kind. She said this is the softer kind, where you can eat it on its own, without having to pair with coffees, like those thin crisp kind. It really smell good while it was baking in the oven. I also made Chicken Burgers for lunch for my family. The burgers were store-bought. I just made the chicken patties and the aioli sauce. It was rather good, but the size was really huge! I have been MIA from baking! Looking back at my posts, I found that I haven't been baking as much as I used to! I wondered what had happened to my baking passion? Wondered if the fire had died down? Can't be! I still love baking as much as before. Perhaps then, maybe because I couldn't find a right recipe to bake? Nevertheless, I can be assured that baking will be less often now, at least for the next few weeks. 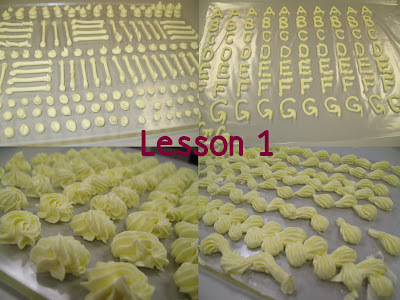 The reason was because I had taken up Cake Decoration courses at BITC, known as Baking Industry Training Centre. It's a 8 weeks part time course. 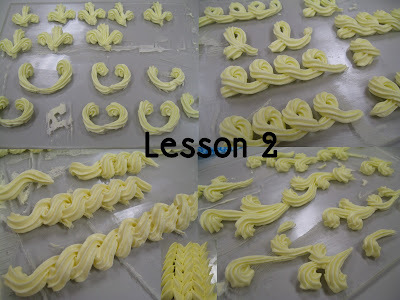 We started learning the different strokes of piping using buttercreams. Not so much excitement now, though when the patterns came out pretty nice, it's quite an achievement. Here's the roundup for this week. I met a student on Friday evening, who was doing the Advance Bread Module at BITC. We happened to chat before the class and I just merely mentioned that I would like to have a bread that she would be baking that day. She mentioned that sometimes they don't get to bake as they need to wait for the dough to proof. Then she left for her class... At the end of my class, she came back with a bag of three buns for me! Isn't she lovely? I was a bit embarrassed as it was merely a casual remark, and she really gave me some. She was really sincere about it! 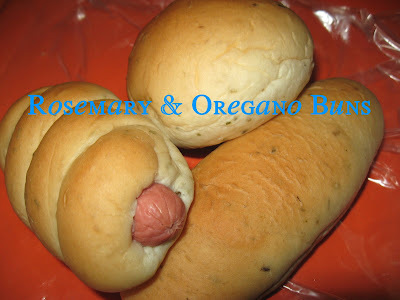 As much as I won't want to accept it, I can't help but smell the aromatic fragrance of the Rosemary & Oregano herbs and I would really want to eat those! These were what I received from her! Don't they just looked yummy? 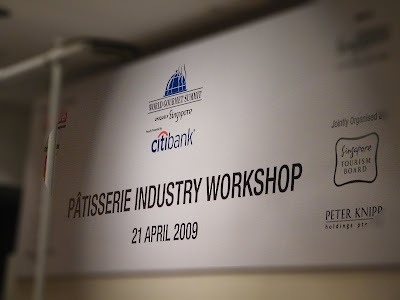 I had a wonderful experience at the World Gourment Summit (WGS) 2009 at its Patisserie Industry Workshop today! I did not expect such as eventful afternoon, held at Singapore Tourism Board Auditorium, to be free!! Anyway, I signed partly because it was free, secondly because it was titled "Patisserie". Any workshops with "Patisserie" cannot be too far off from pastries and cakes right? Initially, the programme was to start at 3pm and end at 5.30pm. However, I was informed by the organiser that it will start at 2pm and end at 5pm. Isn't that better for me then. Actually, I didn't know what to expect during this workshop, so I went there with an open mind, hoping to learn from the big names about baking and patisserie. Anyway, it was a good thing I dragged my spouse along with me too. The event began with an opening from Peter Knipp, followed by a presentation of ready-made chocolates being transformed into beautiful petit fours. This was presented by Chef Franck Michel, World Pastry Champion USA (Phoenix, 2006), MOF Pastry Chef. We had a sample of those beautiful chocolate balls he made. 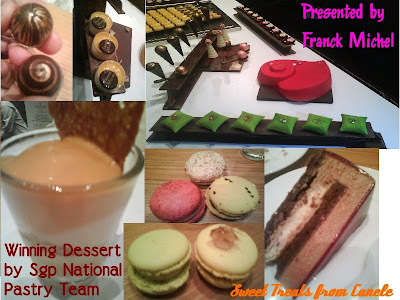 Next were the presentation by the winning Singapore National Pastry Team, lead by Chef Pang from Canele Pastisserie. 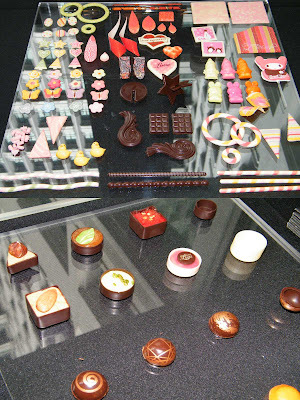 They showcased their sugar sulptures, and re-created their winning desserts for us to try. 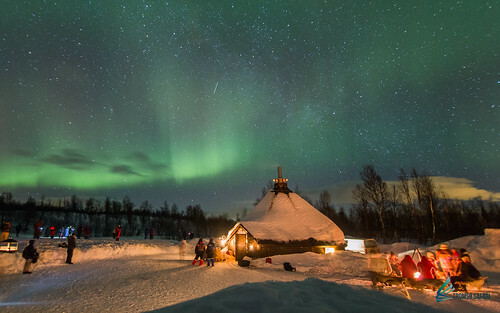 Wasn't that a wonderful experience? On top of that, we still get to eat cakes and macarons!! It's such a treat! What more can I ask for? The chefs are Ruben Sosa, Hoi Kuoki, Jackie Lee (lady) and Ng Chee Leong. All of them looked very young, but very experienced and professional! Actually each presentation was supposed to be 45mins. But I guess this team over-ran. So subsequent presentations were late. The next presentation was by Oriol Balaguer from Spain. His English was quite mimimal, though we did understand his explanation. He presented two items: (1) The 7 Textures and (2) Meringue Ice Cream and Lime. His presentation of the two desserts were really impressive! He went through step-by-step, and was even generous enough to give us recipe! The last, but not least was the sharing of Valrhona with Tea by Vincent Bourdin. He is Valrhona Singapore Regional Pastry Chef. He taught us how to infuse tea with valrhona, and how to pair the various valrhona chocolates with the different types of teas. This is really enriching. We got to sample the different tea-infused chocolates made by him, and understood the different tastes as a result of different chocolates used even though the tea leaves used are the same. There wasn't any dull moments...and my only regrets is not to get more people to go with me, so that we can all learn from the professionals and the experts! Let's wait for next year's WGS. "Comfort food refers to a variety of familiar, simple foods that are usually home-cooked or eaten at informal restaurants. Comfort food is typically inexpensive, uncomplicated, and easy to prepare. Many people turn to comfort food for familiarity, emotional security, or as a special reward. The reasons a dish becomes comfort food are diverse but often include pleasant associations of childhood. Small children often seem to latch on to a specific food or drink (in a way similar to a security blanket [PAB: sounds familiar??]) and will repeatedly request it in high stress situations. 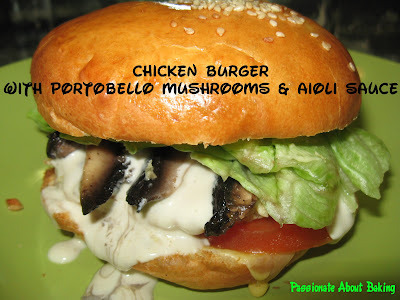 Adults eat comfort food for a sense of continuity." Do you agree to this definition, or do you have your comfort food? Today's bake was not really because I want to use up my red bean paste. Well, er...partly. 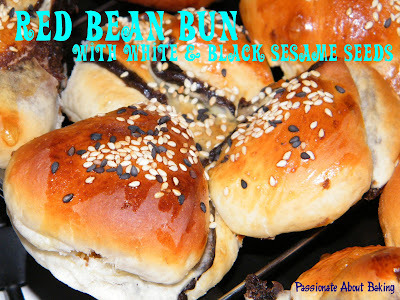 But mostly because, I just love the taste of red bean with sesame seeds on my bread. It was just one simple recipe with five different designs, just for fun. 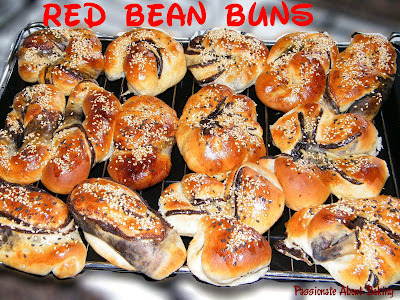 Therefore, I can safely say that, Red Bean Buns are just one of my comfort food. Another comfort food that I can think of, had to be dark chocolates! 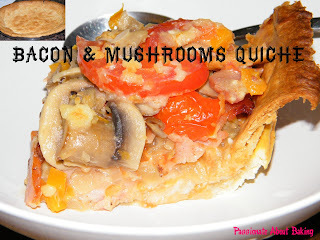 I made bacon & mushroom quiche for lunch yesterday. I like to use Rei's recipe for the crust now. It's really crispy & crusty. Can never go wrong with this crust! A cake for no occassion. There was no special occassion, no birthdays, no celebrations. 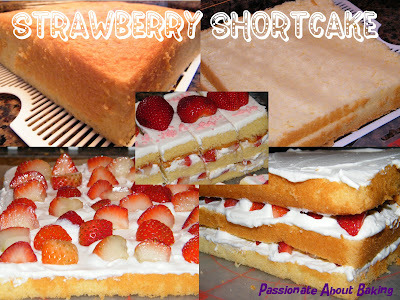 Just felt like making a cake since I bought strawberries yesterday. I was quite happy with the softness of the sponge cake. 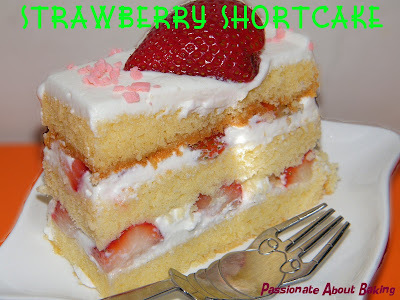 However, when I tried to place some strawberries on top, the cake slice wasn't too stable. They were almost like dominoes. I guess I didn't really "press" them down when I put the final layer on. Nevertheless, it's quite presentable overall! I've not seen this kueh, nor tried it before. 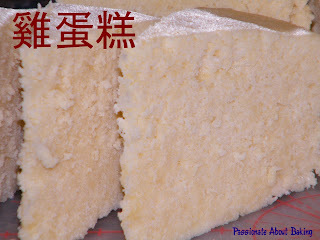 However, the name would have told you it's malay, it's a kind of kueh, and maybe, it's Nonya? 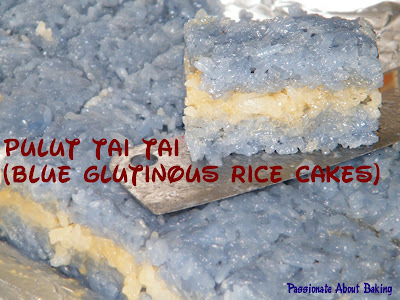 Yes, Pulut Tai Tai, also known as Blue Glutinous Rice Cakes is a traditional Nonya wedding specialty. Why my sudden interest in this nonya kueh? Actually it was not. I was more interested to use up my remaining glutinous rice than anything else! I happened to come across this step-by-step recipe featured in "Food & Travel" magazine dated Sep 2008. 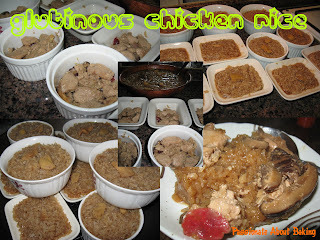 I did not even try to find out more about this food, or compared other recipes, I decided to try this and to use up my glutinous rice. At the same time, my colleague gave me some Blue Pea flowers (Bunga Telang) which is a natural flower dye used in many nonya kuehs. So I wanted very much to use the flowers for colouring. Hence, I decided to try this recipe. Here's the recipe to share with you. 1. 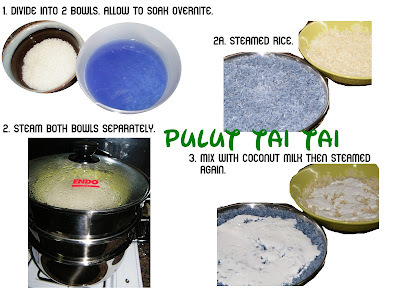 Divide the glutinous rice into 2 bowls, one with 3/4 amount and the other 1/4. Fill each bowl with water until it covers the rice. Drop the food colouring into the 3/4 bowl and stir well. Allow the rice in both bowls to soak overnight. 2. Steam both bowls of glutinous rice separately for 30 to 40mins or until soft. 3. Separately, mix the 3/4 bowl with 175g coconut milk and 75g for the 1/4 bowl. Then steam again for 20 minutes. 4. Cut and clean banana leaf and place them on the bottom of a 10 x 30 x 4 cm cake mould. (As I couldn't get the banana leaf last minute, I used aluminum foil instead). 5. 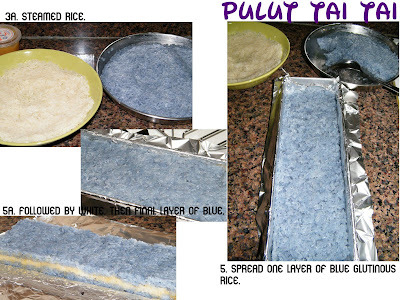 Spread one layer of blue glutinous rice on top of the banana leaf, then layered it with kaya spread. Spread another layer with the white glutinous rice followed by kaya and finish off with another layer of blue glutinous rice. Cover with the banana leaf and set aside to cool. 6. Wrap a knife with cling wrap, to prevent it from sticking, then cut the cake into smaller portions. * Mix the blue pea flowers with 100g water, then squeeze the flowers until desired colour is obtained. Strain and remove flowers thereafter. If flower is not available, royal blue food colouring is used in its place. 6 to 8 drops of royal blue colouring may be used. Actually, for most recipes, the kaya is eaten separately with the rice cake. I think it's supposed to be dipped or spread on top of the rice cake. As I found it quite troublesome to keep taking out the kaya to eat with the rice, I decided to spread them in between the layers. Here are a few other recipes which you can make reference to. 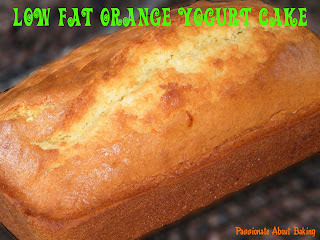 I wanted to bake some simple cakes using my low fat yogurt. The yogurt was in my fridge for quite a while. No matter what, I wanted to finish up the yogurt before I had to discard it when it expired. 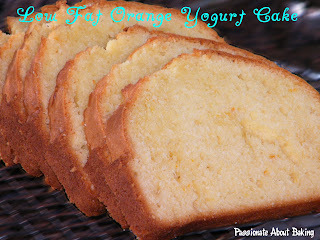 Previously, I had done a modified version of the Orange Yogurt Cake from HHB's recipe. So this time, I followed this same recipe to the dot. Actually not really, I reduced the sugar to 150g and replace vanilla essence with orange extract. The end result? Nice and fragrant orange butter cake. But I suspected I might have overbaked it as it was slightly too dry. When I poured the batter into the tin, it was like so shallow. However, after it was baked, it sort of expanded and "exploded", making it real high! It looked pretty nice too! 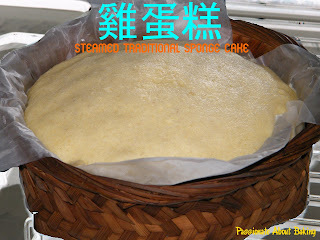 With some time on hand, I've decided to give it another try at the steamed traditional sponge cake, also known as 雞蛋糕. I've tried it twice already, so this will made my third attempt. 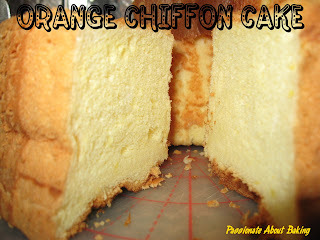 Based on quizzine's new recipe again, I think this is a better sponge cake than my previous attempt. This time, it was with the addition of carbonated drink. The carbonated drink helped to aerate the cake. I used 7-up instead, reduced the sugar to 200g, and used 6 eggs. Unfortunately, I cannot get it to "smile" anymore! Having said that I haven't been quite successful in my bakes lately, I haven't actually stopped baking...well, at least I'm still making some desserts. Maybe, I should let my oven and myself be separated for a while. Perhaps, I should just do some boiling or heating up of chocolates or milk or stuff? Maybe ice-cream? Sorbet? 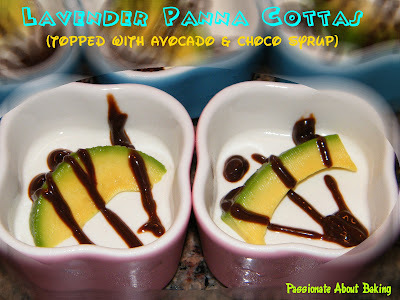 Panna Cottas? As I was out for my workshop today, I made my panna cottas the day before. 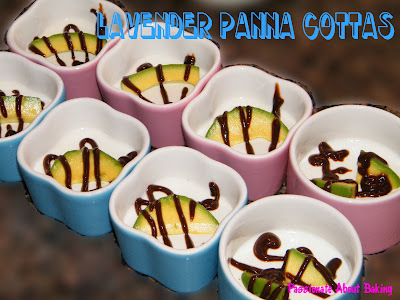 As my previous experience with lavender was pretty good, I decided to make Lavender Panna Cottas. I used the recipe from Tartelette and omitted the apricot. 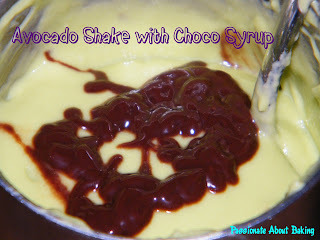 Instead, I placed a small slice of avocado on it and squeeze some chocolate syrup to lighten the taste a little. Indeed, the lavender panna cotta was really good. I've got very good comments on them! I'm just glad it was another good decision made at the last minute! Recipe for Lavender Panna Cottas, extracted from Tartelette. 1. Combine all the ingredients, except the gelatin, in a saucepan over medium high heat and bring to a boil. 2. Remove from the heat and let the cream to steep for 20 minutes. 3. Meanwhile, heat the gelatin in the microwave until the gelatin dissolves completely. 4. Pass the cream mixture through a sieve and stir the gelatin into the cream mixture. 5. Scoop the cream into the cups or ramekins and let them set in the fridge for at least 3 hours, or overnight. 6. Before serving, decorate with anything you like.... Even without decorating, the panna cottas are good on its own! Side track a bit. My colleague taught me a way to eat the avocados. To blend them with milk and ice, then add chocolate syrup to it. This was how I had them earlier. I can only say, it can be addictive! So, be warned! I have been looking forward to going back to Shermay's again for some workshops. When I saw what was going to be demonstrated for the Ultimate Chocolate Treats II by Chef Joycelyn, without hesitation, I signed up for the course for today. Actually what really interest me was the Truffles au Chocolat. In my past few post, I mentioned about having Royce chocolates. The Truffles looked very much like Royce chocolate, and I had wanting to know how to make similar taste to the Royce. Indeed, it wasn't disappointing to attend this workshop and see how Chef Joycelyn did it. Everything she did, made it looked rather simple. In actual, I knew it wasn't that simple to make. The goodies that she made today were really sinful, but really good. She told us that she had attempted 13th times to get the right recipe for her nutella cupcakes, before she finally got it right on the 14th attempt. I do agree that so far, I've seen and even tried one nutella recipe, that does not really bring out the nutella taste. I thought nutella might not really be bakeable. 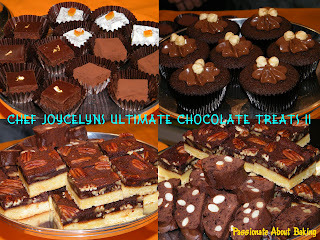 So now I know, there are really a lot of nutella fans out there, including Chef Joycelyn! Besides the four recipes that she made, she also gave us some variations of the truffles, shortbreads and biscottis. She was really very generous with her sharings and experience and tips. I enjoyed her class, though it was pretty short. 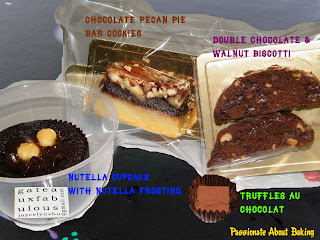 At the end of the class, we got to bring back the cupcake, biscotti and chocolate cookie. The truffle was taken during the workshop. There were just too many "to bake" list that I have. Sometimes, even when I felt like baking some desserts, I would have to give it a thought to see if it is a suitable time to bake. Reason being, if I make too much, I won't be able to finish them all since my family don't really eat desserts. So I must wait till like just before weekend to bake, so that I can bring them over to my parents' place to give them to my sisters and their family. If I do bake during weekdays, I'll bring some food to give them to my colleagues, but not to all of them. Therefore, even baking also must find a suitable day! I've always like Grace's blog. She bakes very beautiful cakes, breads and desserts. So today, I decided to make her Twisted Cheese Bread. Even this had been tried by other bloggers too! Somehow, I cannot get the beautiful "flower" shape that she did. :p Mine turned out to be rather "out-of-shape"! Heehee... Will have to try again next time! As my domestic helper was taking her day off today, I had to be home to watch over the kids. Since I'll be home, I might as well baked some potatoes to bring over to my parents' in law house for dinner. It's not every week that I bake/cook and bring some food over to their place. I usually eat what my mother in law prepares. Actually, I enjoyed eating her dishes. She likes to cook many dishes, and each dish, small to medium quantity. So I have lots of varieties, and I like it! Her signature food is chicken wings! Her chicken wings stays crispy for hours left on the dining table. Yummy! 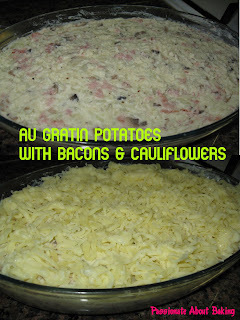 I baked a pan of Au Gratin Poatoes with Bacons, Mushrooms and Cauliflowers. Baked it till golden brown with the smell of cheese aroma in the air! 1. Boil russet potatoes till soft. Then peel off the skins. 2. Cook button mushrooms in some oil or butter, then leave aside. 3. Blanched cauliflowers with some salts. 4. Cook bacons in little oil. Meanwhile, preheat oven to 190C. 5. 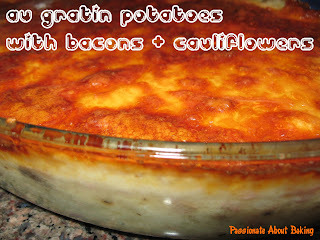 Mashed potatoes into the baking pan, add blanched cauliflowers, cooked mushrooms and bacons. Add the seasoning and cream. Mix them well. 6. Spread the mozzarella cheese all over the casserole. 7. Bake for 20 minutes or until the cheese is golden brown in colour. Recipe taught by my elder sister, Stephanie. I really mean chicken and mousse, not mouse. That was my theme for today. 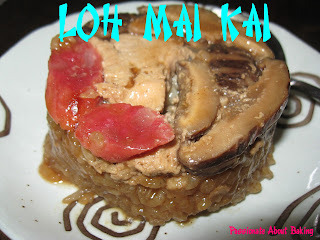 I had already planned, at the beginning of the week, that on Saturday morning, I want to cook glutinous chicken rice 糯米鸡 aka Loh Mai Kai for lunch. This really needed to be pre-planned as rice and chicken pieces have to be bought way before. Even the rice need to be soaked overnight. Surfing through the sites much earlier, I found a simpler version of this, with step by step guide. Using her recipe, I made twice the amount. However, I think I might have added slightly more water, the rice was a bit sloggy, but really easy to chew and swallow. My hubby commented that it was a little on the plain side. As I took the rice with chilli, I can't really tell. :p Too much work for a simple food. Might not be worth to make it afterall! I asked my elder sister yesterday what she would like for dessert today (after dinner at my parents' place). She said "chocolate..." After a few instant messaging exchanges, I told her I'll make chocolate mousse since she asked for it. 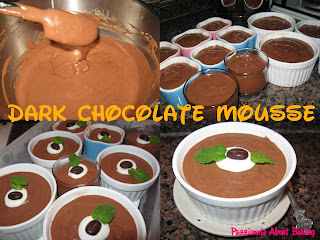 Since I've not done chocolate mousse before, I figured I might as well give it a try since I still have my Ghirardelii baking chocolates. 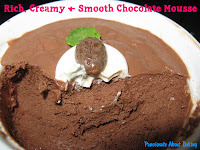 I've been eyeing a few chocolate mousse recipes, including this from David Lebovitz's site. After a few rounds, I decided on this recipe from Daily Delicious. This recipe doesn't use butters, and looks more healthy compared to the rest. 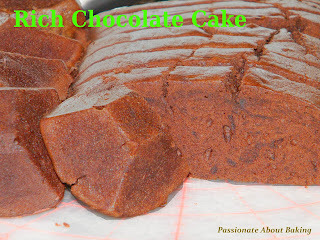 I doubled the recipe, and used a mix of 60% & 72% baking chocolates. As I was folding the melted chocolate into the beaten eggs, I can really smell the strong chocolate taste. So when I folded it into the whipping cream later, I can't help but to pinch from the side to taste! 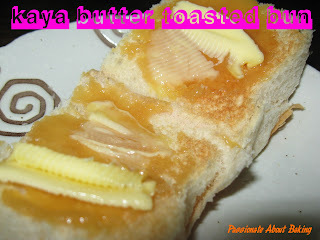 The smoothness and the cooling taste just lingers in my tongue...Yummilicious!! I decorated them with light chantilly cream, topped with coffee bean chocolate and mint leaf. Doesn't it all looked more presentable now? 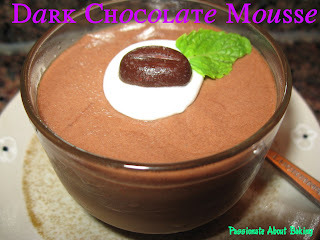 Recipe for Dark Chocolate Mousse, extracted from Daily Delicious Blog. 1. Put the chocolate in a heatproof bowl. Half fill a saucepan with water and bring to the boil. 2. Remove from the heat and place the bowl over the pan, making sure it is not touching the water. Stir occasionally until the chocolate has melted. Leave to cool. 4. Using a spatula, fold in the melted chocolate with the rum, leave the mixture to cool, then gently fold in the lightly whipped cream until just combined. 5. Spoon into the ramekins or dessert glasses..
6. Refrigerate for 2 hours, or until set, or overnight. Decorate with extra whipped cream and mint leaves. Sprinkle cocoa powder if desired. With some time to spare after my kaya breakfast, I decided to bake some chiffons as they are light and nice. Initially, I wanted to try using Japaneses potatoes, but it required coconut milk. Not willing to use my coconut milk yet, I dropped the idea of using Japanese potatoes. 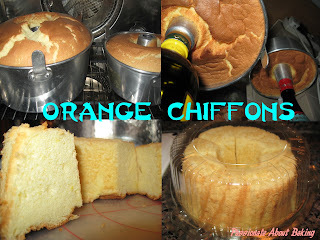 Finally, I baked orange chiffons as I'm very familiar with this and I'm quite sure nothing can go wrong. I'm happy with the outcome, thankfully! Hey fellow food bloggers! The long awaited potluck party has been arranged!! Like some of you mentioned earlier under comments in my past post, your wish (and mine) has come true!! 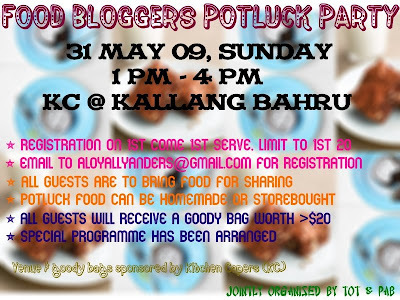 This is the detail of our first ever, Food Bloggers' Potluck Party! * Email to aloyallyanders@gmail.com your name, contact number, what you'll be baking/cooking/bringing and your blog url. * A detailed email will be sent once your registration is confirmed. * Goodie Bag worth >$20 for all guests! Disclaimer: This party is organised for food bloggers residing in Singapore only. After a little lavender craze, it's now back to normal baking. I cannot, simply cannot resist good chocolate cakes. Whether it's frosted or not, it doesn't matter. As long as they looked rich to me, I would love to grab it and stuff it into my mouth! Hahaha... The more bitter it is, the better. I'm a big fan of dark chocolates. Last week, my sister's friend bought her a box of Royce dark chocolates: 80% & 90%. Yummy!